There are online groups filled with thousands of people from all over who gather to brag about their latest vintage sewing machine find. If you do an online search for vintage sewing machines, you'll come up with many listings. Some sell vintage machines, while others sell parts. Some totally restore vintage sewing machines, others reproduce the decals. Some handcraft beautiful wooden cases. Those machines which cannot be repaired are reclaimed, and there are some very imaginative people out there. The point is, vintage sewing machines are not disappearing anytime soon. 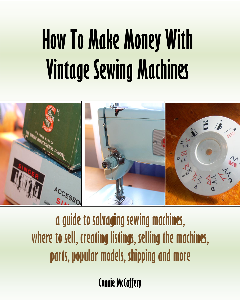 This guide will tell you about sewing machine salvage- where to find machines, selling sewing machines, selling parts, creating listings, where to sell, popular models, shipping and more. Available in both Paperback & Kindle. Check out my other sewing related titles.